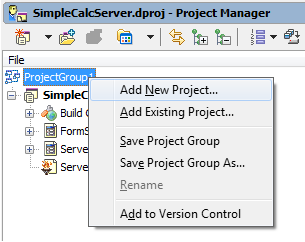 Select in the main menu “File -> New -> Other” and from the “New Items” dialog double-click on the “DataSnap Server” icon in the “Delphi Projects -> DataSnap Server” category. On the second tab keep all the default values. Later we are going to replace sample DataSnap server methods with our own implementation. 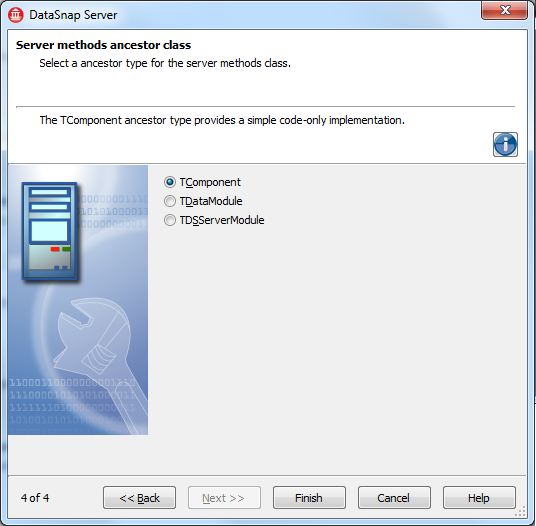 On the last tab we are going to keep default server methods ancestor class which is “TComponent”. Save the whole project by clicking on “File -> Save All”. Create a new directory for all files in this lab – for example “C:\DataSnapLabs\SimpleCalc\”. 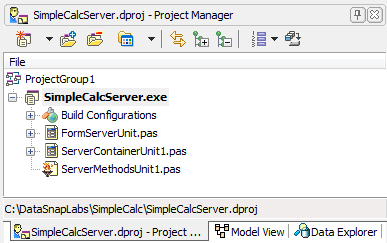 Save main application form as “FormServerUnit” and keep default names for all other units – typically “ServerContainerUnit1” and “ServerMethodsUnit1” – and save project as “SimpleCalcServer”. 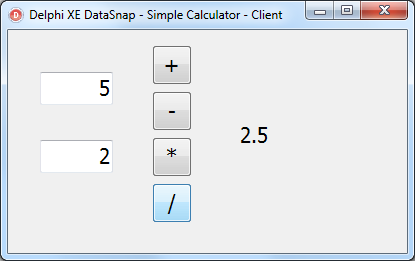 Open “ServerMethodsUnit1.pas” unit and implement the functionality of the simple calculator service. 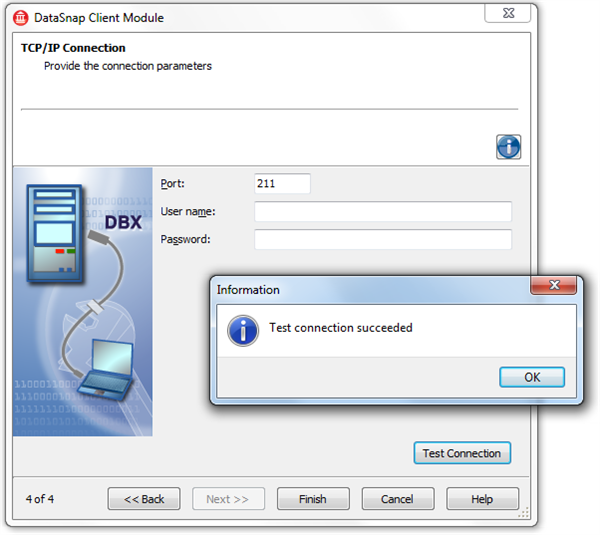 Replace sample methods added by the wizard (“EchoString” and “ReverseString”) with “Add”, “Subtract”, “Multiply” and “Divide” methods. Our server is now fully implemented. In order to develop the client application, the server has to be running. 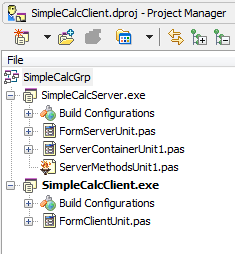 Locate the folder where the server project has been saved and save there the main form unit of the client application as “FormClientUnit”, the new project as “SimpleCalcClient” and the project group as “SimpleCalcGrp”. Make sure that the client project is active and from the “New Items” dialog select “DataSnap Client Module”. Again we are going to keep all the default values in the wizard. On the first tab keep the “DataSnap server location” to “Local server”. 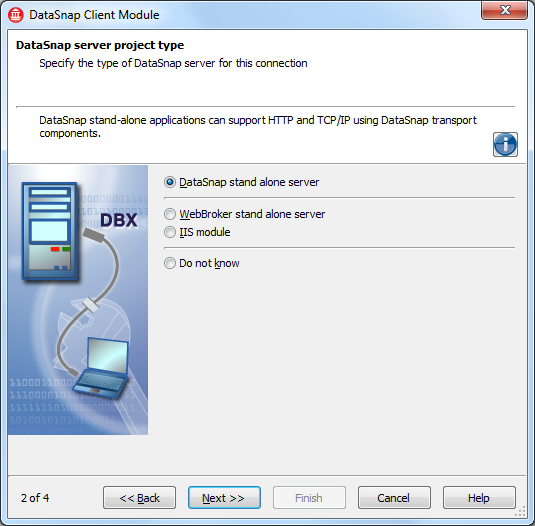 Our DataSnap server is “stand alone” so keep the default value and click “Next”. Our server is using “TCP/IP” as the connection protocol, so keep the default selection. 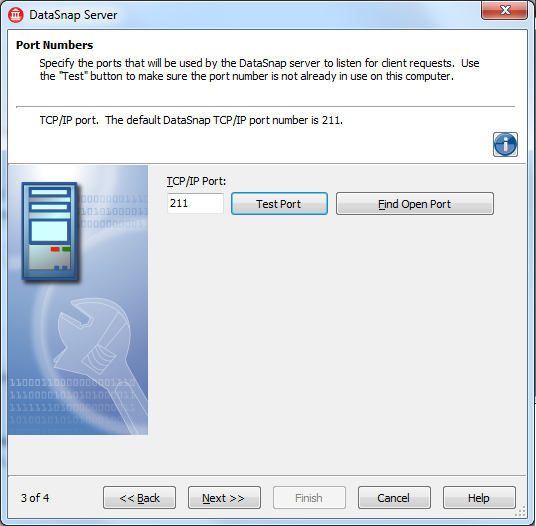 Click on “Test Connection” to verify that the server listens on the default port 211 and click “Finish”. 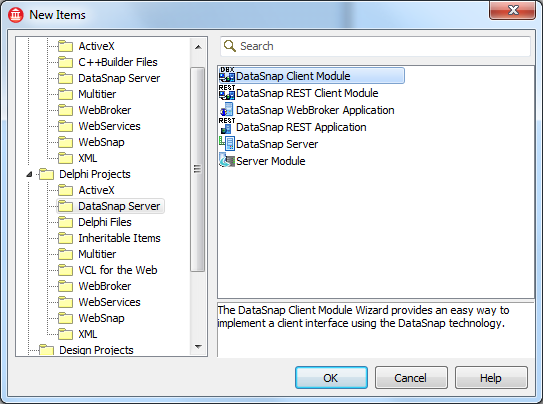 The wizard will add two units to the client project: “ClientClassesUnit1” and “ClientModuleUnit1”. 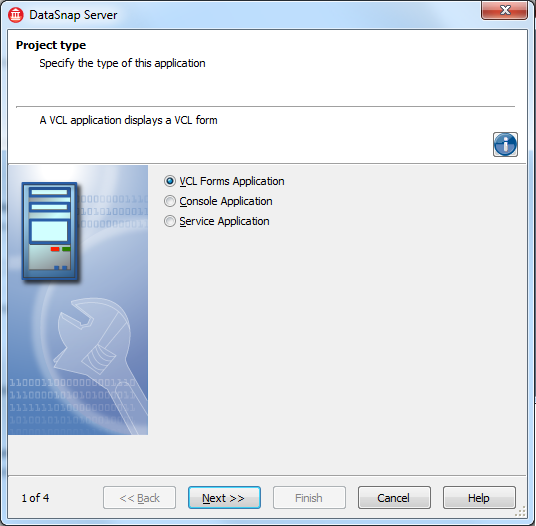 The last task in this lab is to implement the user interface of the client application. Let’s start from “using” the “ClientModuleUnit1” unit in your client’s main form unit. 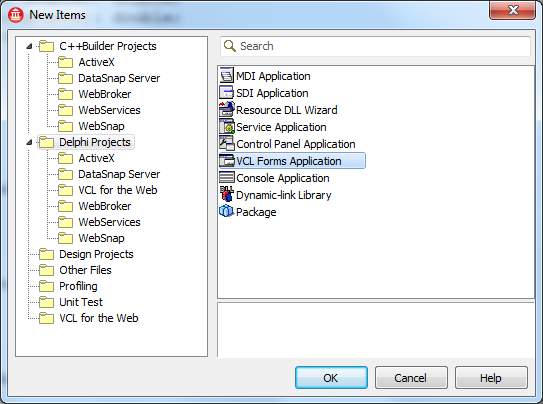 Make sure that client form unit is open in the editor and select “File -> Use Unit”. Now in your client form’s code you need to use methods exposed via “ClientModule1.ServerMethods1Client” property. 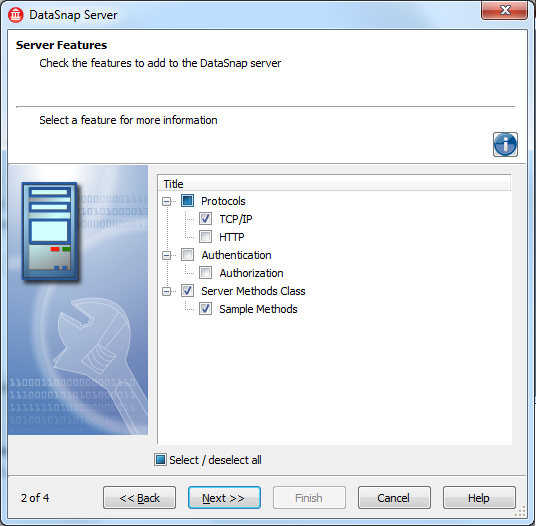 These methods have the same names and signatures as methods available on the server. Below is the implementation of the main client application form. Listing 2: Implementation of client’s main form. In this Delphi Lab we have used Delphi XE for building a simple calculator DataSnap XE service consisting of server and client native Win32 applications communicating with each other using TCP/IP protocol. The video version of steps described in this article can be found on YouTube (http://www.youtube.com/watch?v=Qm__RdmIWSg).